BELLVILLE, Texas – The contestants who make the Austin County Fair and Rodeo part of their schedule recognize the hard work the volunteers put in to make it a successful event. The proof came last year when the barrel racers in the Women’s Professional Rodeo Association recognized Bellville’s rodeo as one of the best in Texas. They named it one of the top four in the Justin Boots Best Footing Awards in the Texas Circuit. 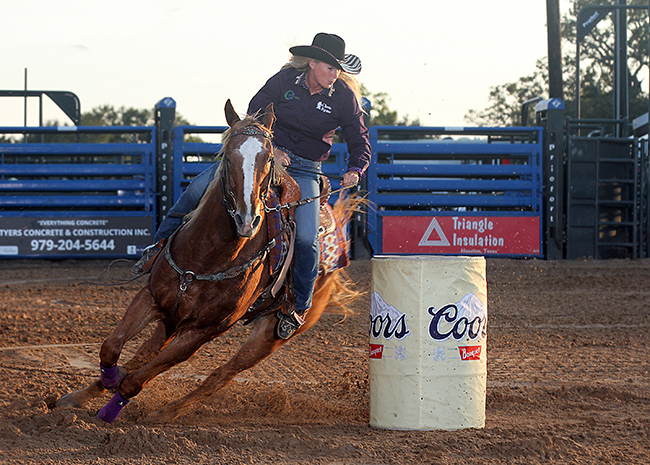 “It’s because that committee has worked really hard,” said Tammy Fischer, a six-time Wrangler National Finals Rodeo qualifier from Ledbetter, Texas, who is closing in on her seventh trip to Las Vegas in December. “For years, the ground has been notoriously deep, but they reworked the arena and have made it so much better. And that’s why the women who voted selected the Austin County Fair’s rodeo as the third best in the state. Bellville finished behind Stephenville and Fort Worth, both of which are indoor facilities and don’t have to deal with the elements as much. But the women of the WPRA took notice, and they made their votes count. Many will be in Bellville for the rodeo, set for 7:30 p.m. Thursday, Oct. 11-Saturday, Oct. 13, at the Austin County Fairgrounds. “Because they put forth such great effort to fix it, it was possible to place all the way across, whether you were in slack or whether you were running on Saturday night,” said Fischer, who placed in a tie for 10th a year ago. “There was a time that you usually had to be in Bellville on the last night to get a check. The more they worked the ground and watered the ground that week, the better the ground got. It’s also vital to kick start the 2019 rodeo season. The existing regular season will end Sept. 30, so the new campaign begins in October. With Bellville being such an early-season event, the cowgirls want to get a fast start to set up their winter run of rodeos. That’s the main reason why the ladies honored the volunteers who are part of the Bellville rodeo experience. Thank you Tammy. As a 30 + year director and a rodeo sponsor the rodeo works hard to make it good for the contestants. Ricky Huff and his committee do a great job. I accepted the award last year for us and was truly honored. Good luck!